The Spray On Smart Bandage was invented by Professor Conor Evans of Harvard Medical School. It is sprayed onto the skin in the form of a viscous liquid. The liquid dries to form a solid film in about a minute. After the first layer dries a second layer is then sprayed on. 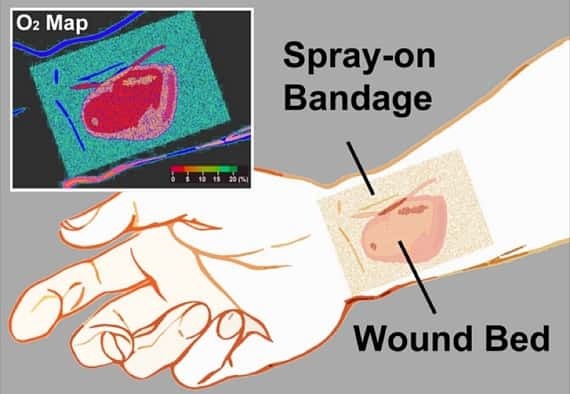 Unlike other bandages, the Spray On Smart Bandage allows you to monitor how well the wound is actually healing. This is important especially when it comes to monitoring burns and skin grafts. The bandage allows the wound to be monitored as it measures the level of tissue oxygenation. It does this by emitting corresponding light. When a camera or a smartphone with a flash is used to photograph the wound a heat map is captured. This is made possible because of phosphors. Phosphors absorb light and emit it back. This enables a heat map of the wound to be captured.